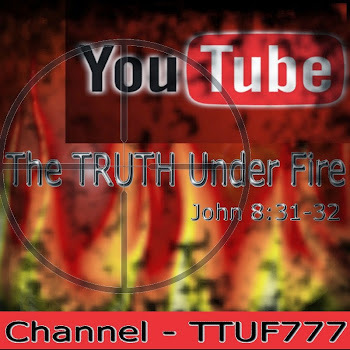 The TRUTH under FIRE: The Battle for the Bible – Does Inerrancy and Infallibility Really Matter? The Battle for the Bible – Does Inerrancy and Infallibility Really Matter? 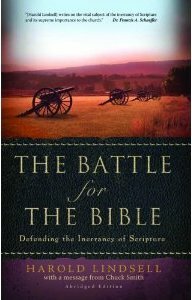 I recently purchased a copy of The Battle For The Bible by “Dr. Harold Lindsell. It is an old publication, originally published in 1976, yet its documentation is extremely important in this present church age as we are witnessing the abandonment of the essentially orthodox view of Scripture. It is because I believe strongly that the Bible is the Foundation upon which we as Christian’s stand that I write the introduction to this next series of articles entitled, The Battle for the Bible – Does Inerrancy and Infallibility Really Matter? This series will be heavily based upon Dr. Lindsell’s expertise and research covered in this book, and of course upon the Scriptures themselves. Though many do not distinguish between the words Inerrancy and Infallibility…there is a slight difference. Dr. Lindsell uses the words interchangeably…while others tend to distinguish between them. “The Bible is infallible, meaning it does not deceive. It means the Bible will never deceive us in matters of faith. In spiritual matters it is trustworthy. It has absolute authority and will never lead us astray. However “infallible” as currently used, neglects to tell us something about the Bible. Is the Bible historically accurate? Did the events of the Bible really happen? This is where the word Inerrancy comes to play. This word means that the Bible does not make a statement contrary to fact…not only in matters of faith….but also in all other matters. Today while many of the matters under attack are the historical and scientific accuracy of the Bible, the terms used must be clarified.” I will use both so as not to confuse anyone. Dr. Harold Lindsell (1913-1998) began his career at Columbia Bible College, Columbia S.C. as professor of history of missions from 1942-44. He was ordained a Baptist minister in 1944 and served as professor of missions and church history, 1944-47 at Northern Baptist Theological Seminary, Chicago, Ill. From 1947- 1964, he taught at Fuller Theological Seminary as professor of missions, Dean of the Faculty, and Vice President. He was Associate Editor of Christianity Today from 1964 -1967 and professor of Bible at Wheaton College from 1967-68. He returned to Christianity Today as Editor from 1968- 1978. He also taught at Simon Greenleaf School of Law. He wrote and edited more than twenty books including The Battle for the Bible, The Bible in Balance, Free Enterprise: A Judeo-Christian Defense, Armageddon Spectre, The New Paganism, and The Holy Spirit in the Latter Days. He also served as editor for the Harper Study Bible, Tyndale Words of God for Every Day, and The Everyday Pocket Bible. Does what we believe about the Bible really matter? Is the Bible really Divinely Inspired, Inerrant, Infallible and the Absolute Authority in all truth? For me, the answer is YES! ABSOLUTELY! For others who are questioning or even denying, we shall endeavor to convince and assure them that God’s Word is absolutely trustworthy. What we believe about the Bible matters immensely because Truth Really Matters. In today’s age truth is hard to come by, which is part of the problem. Multitudes have been accommodating lies for decades. It has unfortunately become a way of life in our culture, too many today believe it is "normal" to tell lies, and be deceived by lies. Sad, but true! 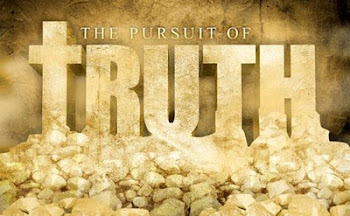 When one becomes accustomed to lies, discernment is dulled and truth has been lost to all. Since God is the author of all truth, and Satan the Father of lies, shouldn’t we love truth, believe truth, and follow hard after truth? But how can we do that when we doubt even the source of all truth, and His written word to us? After many debates with other believers, biblical scholars and leaders in the past couple of years over portions of scripture that are discarded as fictional stories, this issue has laid heavy on my heart. In an article written by Albert Mohler, he discusses this battle over the inerrancy of Scripture. In fact, he claims (and I agree) that there seems to be a full blown effort to forge an evangelical identity apart from the claim that the Bible is totally truthful and without error. Dr. Mohler goes on to say, “This argument is taken to the next step by Kenton L. Sparks in his 2008 book, God’s Word in Human Words: An Evangelical Appropriation of Critical Biblical Scholarship. Sparks, who teaches at Eastern University, argues that it is nothing less than intellectually disastrous for evangelicals to claim that the Bible is without error. His arguments, also serialized and summarized in a series of articles, are amazingly candid. He asserts that Evangelicalism has “painted itself into an intellectual corner” by claiming the inerrancy of Scripture. The movement is now in an “intellectual cul-de-sac,” he laments, because we have “crossed an evidential threshold that makes it intellectually unsuitable to defend some of the standard dogmas of the conservative evangelical tradition.” And, make no mistake; inerrancy is the central dogma he would have us let go." Of course there is no doubt that Sparks fully understands the evangelical doctrine of biblical inerrancy, but declares it “intellectually disastrous”. Mohler reveals that the articles written by Sparks appear at the BioLogos Web site. If you have kept up on all the homeschool chatter this past year, it has been made clear that BioLogos would like to move evangelicals toward a full embrace of evolutionary theory….of course Biblical inerrancy presents a huge obstacle towards that end. Sparks claims, that the “evidential threshold” has been crossed, and the Bible has come up short. The biblical writers were simply trapped within the limits of their own ancient cosmology and observations. Shocking, isn’t it? Sparks takes this deviancy once step further, he further suggests that Jesus “was a finite person who grew up in Palestine.” and proposes that Jesus made routine errors of fact. The incarnational model of inspiration and biblical authority that both Peter Enns and Kenton Sparks argue for is not new among evangelicals, it's a battle that has been going on for years. However, Mr. Sparks, takes the argument much further, his model implicates Jesus. He suggests in an article called 'After Inerrancy', that Jesus “was a finite person who grew up in Palestine...If Jesus as a finite human being erred from time to time, there is no reason at all to suppose that Moses, Paul, [and/or] John wrote Scripture without error." What is outrageous to me is that Mr. Sparks affirms his belief in the historic Christian creeds and “traditional Christian orthodoxy,” We will go into further detail about the confusion of those like Mr. Sparks who claim orthodoxy, yet deny inerrancy a bit later. The question of Infallibility and Inerrancy becomes more urgent. Can the Bible be trusted as the absolute infallible and inerrant Word of God? For me the matter is settled, but as you can see there is a battle going on, we must stand firmly upon God’s truth. Dr. Lindsell supports the historic view of an infallible and inerrant Bible in his book which has been the longstanding tradition of fundamentalists and evangelicals for many years. Because of the more recent departure from this viewpoint from the new-evangelical revisionists, the change is now widespread in evangelical denominations, Christian colleges, theological seminaries, publishing houses and learned societies. The first is that the Bible is not at all trustworthy. If this answer is correct, then Christianity stands upon a false foundation. Anyone who professes a faith founded on a source that cannot be trusted is a fool, is naïve, or is deluded. Certainly no thinking or honest person would embrace, recommend, or propagate a religion based on what he knows to be untrue. The second is that the Bible can be trusted as truthful in all its parts. By this I mean that the Bible is infallible and inerrant. It communicates religious truth, not religious error. Further, whatever it communicates is to be trusted and can be relied upon as being true. The Bible is not a textbook on chemistry, astronomy, philosophy or medicine. But when it speaks on matters having to do with these or any other subjects, the Bible does not lie to us. It does not contain error of any kind. Thus, the Bible, if true in all its parts, cannot possibly teach that the earth is flat, that two and two make five, or that events happened at times other than we know they did. The Bible could not, if it is trustworthy, say the Julius Caesar was emperor when Jesus was crucified, or that Caesar Augustus perpetrated the sack of Jerusalem in A.D. 70. If it did these things, it then would be conveying information to us that is palpably false. The Third and last possibility is that the Bible contains some truth and some error (this is the view of many of our new evangelicals). Part of what it says can be relied upon, and some of it must be regarded as false. In other words, the Bible is neither completely trustworthy, nor completely false. The proportion of the material that is truthful may be greater in volume than that which is untrue. But wholly apart from the proportion of that which is truthful and of that which is in error, the Bible is a mixture of both. It makes no difference whatever that the false information may have come about due to ignorance, carelessness, or any other reason. Indeed, no one need presume that any part containing error was introduced deliberately. Of course we must understand that there is a wide diversity among those who believe in a fallible Bible. Some like Dr. Enns hold to errancy that does not go beyond science and history (which in my opinion is bad enough). However there are others like Prof. Sparks who are rejecting some of the basic doctrines of the Christian faith. Do you see the danger? This is the main crux of the book, says Dr. Lindsell, to understand and to be made aware of what is happening, why it has happened, what the prospects are in the near future for further changes, and what history teaches us about the ultimate outcome when Christians cease to believe in an infallible, inerrant Bible. We must remember that the Bible originated in the mind of God, not in the mind of man and thus means a great deal more. Its inspiration is not the same as the inspiration of a great novelist, artist or musician. Divine inspiration is not derived by “human genius” as many postmodernists suppose. The Bible's authority is not derived from reason. Though we believe the Bible to be reasonable, it is because it is the Word of Him Who is the source of all reason! Our reason needs to be approved by the Bible and not the Bible by our reason. Today it’s as if some study the Bible to prove to God and man that is full of error and cannot be trusted and by doing so they have completely missed the mark. Yet in 2 Timothy 2:15 we are exhorted to, “Study to shew thyself approved unto God, a workman that needeth not to be ashamed, rightly dividing the word of truth.” Also, Romans 12:2 comes to mind, that we are transformed by the renewing of our minds. The attitude that we have toward the trustworthiness of Scripture determines our later position, not only on faith, but also on practice. The evidence that those who surrender the doctrine of inerrancy inevitably move away from orthodoxy is indisputable. In these days when theological definitions are disfavored and human speculation has attempted to eclipse divine revelation it is essential that we define what we mean when we say the Bible is the Inspired Word of God. So here goes, I believe the Inspired Word of God to be of divine authority, completely infallible, inerrant, and absolutely sufficient, not just some of it…BUT ALL OF IT! You see, we can think whatever we want about a great number of things, as it really doesn’t matter much in the grand scheme of things. But when it comes to the Bible, what we believe about it affects our understanding of the fundamentals of the Christian faith, it also affects our eternal destiny, and that matters a great deal. Does a poisoned well bring forth clean water? You may think this an absurd question, but how is that any different than suggesting that God's Word is full of errors, but we can still trust it enough to believe on Him. As I have stated, in the past couple of years I have noticed an all out attack upon the authority and inerrancy of the Scriptures. Over and over again, I have been challenged by those who reject the Bible as the final authority in all matters that concern mankind. The most troubling fact of all is that the attacks are coming from among the evangelicals once counted on as those who hold to orthodox views. Unfortunately, in a vain attempt at making the church more relevant to this postmodern world, Church leaders have deviated from biblical inerrancy thus corrupting the word of God and the doctrines of the Church. It is in my opinion the biggest problem facing the modern evangelical church. When discussing this with James, co-writer for T.T.U.F., we both agree that being labeled anything other than Christian these days, can be challenging at best. Though I/we feel the need to distance ourselves from the new evangelicals today, perhaps the term ‘separatist’ fits us better. Separating from the world and its sinful proclivities, as well as the liberal theology of today, while maintaining orthodoxy is becoming extremely unpopular amongst those who consider themselves part of ‘mainstream’ Christianity. Yes, I think ‘separatist’ fits us better. Dr. Lindsell goes on to explore the ethical dilemma of holding an errant view, while at the same time continuing to claim orthodoxy. One of the many problems among those who have swung from an infallible to a fallible Bible face an ethical dilemma of subscribing to what they no longer believe. Integrity goes out the window. They operate within creeds or confessions of faith that affirm an infallible Scripture, yet deny it publicly through their teaching and practice. Add to this the institutions, publishing houses and denominations that insist that their theological stand remains with the infallibility and inerrancy of Scripture, but the fact remains that they are failing miserably in practice. Today, Publishing houses seem to be printing every wind of doctrine, heresy and newest perversion of the Bible…where is their stand for biblical inerrancy and truth? Why not clarify where they stand and publicly make it known? To give the impression that they stand on the old truths, when in fact the reality is, they really don’t, is dishonest. Is the Bible fully or partially trustworthy is absolutely a watershed question. It is a critical point that draws a line in the sand. The marking of a division or a change of course; a turning point which at some point further down the road creates such a gap that cannot be closed. For instance, Dr. Lindsell explains, many that don’t believe in an infallible Scripture may still believe in the Trinity, the deity of Christ, the vicarious atonement, physical resurrection, and His second coming. These are essential doctrines of the Christian faith and many argue that this issue of infallibility a secondary issue. The same argument has been made over modern Bible versions. Here’s the problem, based on past history, what “seems” like a small difference of opinion at this point later becomes an enormous gulf later on. The differences will increase as we see other doctrines discarded with the doctrine of infallibility. You see, once infallibility is abandoned, it opens the door to further departures from the faith. Dr. Lindsell states, “Once errancy enters an institution, it does not simply become one of several options. It quickly becomes the regnant view and infallibility loses its foothold until at last it is silenced effectively. When one surveys the current scene in places where errancy has gotten a grip, it soon becomes obvious that there are few champions of inerrancy ready or willing to challenge the new reality.” Without such a challenge to those opposing inerrancy, the case can be made in such a way that the unlearned and unsophisticated will absolutely fall for it…hook, line and sinker! Does what we believe about the Bible matter? Absolutely! The terrible results of the dethronement of the absolute authority, infallibility, inerrancy, and sufficiency of the Bible can clearly be seen all around us today. How many institutions and denominations have gone astray? How many will follow them? Are we not reaping the harvest of the sowing of modernism? In a postmodern world, we see the end result of those seeds. The heresies spread throughout the evangelical church, the compromise with new age, humanism, universalism, the emergent movement, the new apostolic reformation and the ecumenical nightmare can be plainly seen. A deviation from what the Bible truly is, it’s Author, its authority, sufficiency and infallibility has created for us an unrecognizable gospel with a perverted message, and a church that has lost its effectiveness in this lost world. Embracing errancy has led to and will continue to lead to disaster. Dr. Lindsell describes that congregations have gone to sleep, it has produced spiritual sloth and decay…and by the looks of it has led many to apostasy. These are indeed some of the evil consequences of adhering to errancy. A perfect example of this is the Unitarian Universalist denomination. The underlying fact in their departure from orthodoxy was their disbelief in the infallibility of the Scripture. Fact is that in the early nineteenth century, the differences between the Unitarians and the orthodox didn’t appear to be so great…but today, there is a profound difference. Many Unitarians are atheists; humanists…even Buddhists….hello? The doctrines of sin and hell have disappeared. The doctrine of the trinity denied. The gospel is not preached to the lost, nor is the Bible taught in their pulpits. They are completely apostate. I must caution that the departure from an infallible Scripture does not necessarily mean that all have fallen into some apostate religion. However, I honestly believe it is significant and dangerous to the church because it deviates from sound truth. If for instance one denies the biblical flood, the creation account, if Adam and Eve were real people or fictional characters, one begins to question all of the bible, the history, the prophetic scriptures and even the gospel of salvation. A denial of the creation account would endorse evolution, wherein death and dying was common place for hundreds of millions of years and thus trivialize the account of the fall of man into 'sin' and subsequently, death, and relegating such to mere 'fable' which would dismiss the need for the Gospel, for the Cross, for the atonement by Jesus Christ for the sins of the world! As we have seen from Dr. Mohler’s article that this mindset is coming out of today’s seminaries. Further, it is this mindset now teaching the next generation of seminary students and publishing curriculum for Christian homeschoolers. Leaders who deny the inerrancy and infallibility of scripture fail to teach expositionally. By expositionally, I mean preaching in such a way that the meaning of the Bible passage is presented entirely and exactly as it was intended by God. If we believe that "all Scripture is inspired by God" and inerrant, must we not be equally committed to the reality that it is "profitable for teaching, for reproof, for correction, for training in righteousness; that the man of God may be adequate, equipped for every good work"? Should not that magnificent truth determine how we preach? There is a a fierce battle raging today which centers on the Bible’s trustworthiness. Is the Bible infallible and inerrant? Many evangelicals say yes to varying degrees. Should we ignore the fact that so many are now falling into the camp which deny the infallibility and inerrancy of the Bible? As Dr. Lindsell and others point out, when looking from a historical perspective it cannot be denied that the Christian church for over 2,000 years has unanimously agreed that the Word of God is completely trustworthy in its fullness. So the question is, what has changed? When did it change and why? We will seek out the answers to these questions in the continuation of this series of articles. Dr. Lindsell examines the evidences, puts forth the arguments, and illustrates the opinions by specific examples to make the case as impregnable as possible. The writers of the Bible were men under the influence of the Holy Spirit and who were inspired by God to write the inerrant Word of God. God, our Creator, has revealed Himself, and proven Himself by His own influence to mankind, that we might believe! If His Word is questioned, His Authority is questioned, His messaged is then questioned…If everything is questionable, untrustworthy and unreliable, let me ask you, who will believe? God’s purpose for giving us the His Word, is so that we would believe, trust and coming to the saving knowledge of His Son Jesus. He reveals Himself to us, His great character, His ability, His power, grace, righteousness and a million other things. If this is indeed His purpose let me ask you this, would God communicate error to us? Certainly the hour is late, yet it is never too late to get back to the Bible. A rediscovery of the Word of God brought about the glorious Reformation of four-hundred years ago, men like Luther, Tyndale and many, many others who believed that the fight for the Bible and the gospel message was more valuable than their very lives. How much more do we need His Word in these final hours? It is my prayer that all of God’s Word will rule our hearts, and minds, and homes; and not the lofty thoughts of man. May the Lord bless you and may His unfailing promises be yours and mine as we wait for His return. The bible is true because it says it's true. (Based on one narrow interpretation of a reading). Science has a very different view of the world based on observable evidence and data. Science and your interpretation of the bible have conflicting conclusions. So ...... The findings of science are wrong because it conflicts with your biblical interpretation AND it raises too many epistemological questions. That is quite a corner you've painted yourself into. It reminds me of a certain lawyer arguing what "is" is. "The bible is true because it says it's true." Answer: The short answer is yes! But that is not the full answer. Unfortunately, this post is part one of a series that have not been completed....so you will have to revisit your statement at the end of the series. A more complete answer to your comment is that the bible is true first and foremost because it says it's true. For those who claim to be believers, this should not be an issue. Those who refute the bible as being true would have a problem with this. Since the article is dealing more with those within Christianity, the authority of Scripture is the foundation of our Christian faith. If the foundation be removed, then where does Christianity stand. Bible writers claimed repeatedly that they were transmitting the very Word of God, infallible and authoritative in the highest degree. This is an amazing thing for any writer to say, let alone the forty or so men who wrote the Scriptures. book, the Bible is actually a collection of 66 books, which is called the canon of scriptures. These 66 books contain a variety of genres: history, poetry, prophecy, wisdom, literature, letters, and apocalyptic just to name a few. These 66 books were written by 40 different authors. These authors came from a variety of backgrounds: shepherds, fishermen, doctors, kings, prophets, and others. And most of these authors never knew one another personally. and cultural circumstances in which each of these books were written. Also, the historical accuracy of the Scriptures is likewise in a class by itself, far superior to the written records of Egypt, Assyria, and other early nations. Archeological confirmations of the Biblical record have been almost innumerable in the last century. There's plenty of proof available to those who would like to do some research in this area.